Police investigating shooting at a house in Netanya. Six wounded. 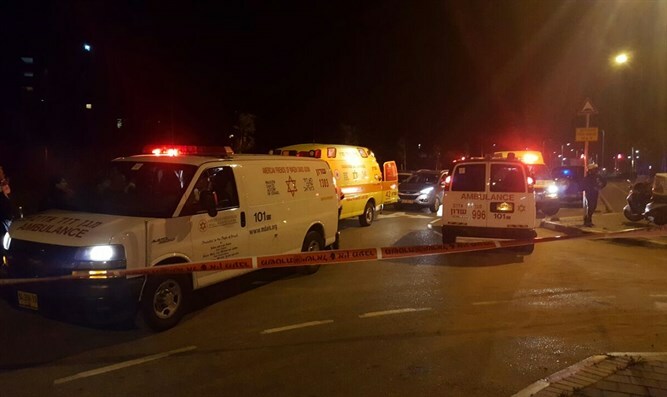 Two people were killed and six others were wounded when gunfire was opened at a house in Netanya on Monday night, before midnight. Magen David Adom paramedics treated the victims, all men, and evacuated them to the Laniado Hospital in Netanya, the Hillel Yaffe Hospital in Hadera and the Meir Hospital in Kfar Saba. A total of eight victims were transferred to hospitals, but two of them wer later pronounced dead. Police have launched an investigation into the shooting, and a preliminary assessment indicates that the incident was criminally motivated. On Tuesday it was disclosed that the two dead men were 19-year-olds Aviv Boaron and Ron Yaacov of Netanya. The Netanya shooting was the third criminally related shooting in one day. In the first incident, a security guard of a criminal known to the police was killed when shots were fired at him from a passing car in the city of Bat Yam. In another incident, a 47-year-old-man was shot and killed in Umm al-Fahm. Another man was moderately wounded.